The Incredible Computer-Controlled … Computer! 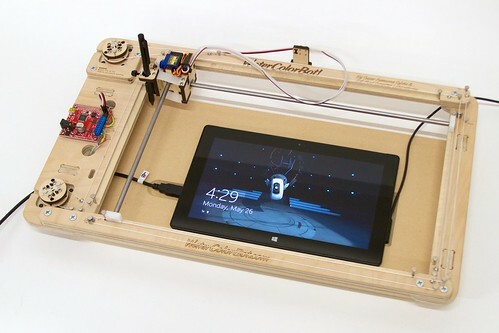 About a year ago, I started working on a project that used robotics to control a Surface Pro tablet. Not long after I started, I got my first glimpse at the the WaterColorBot on display at Maker Faire Bay Area 2013. 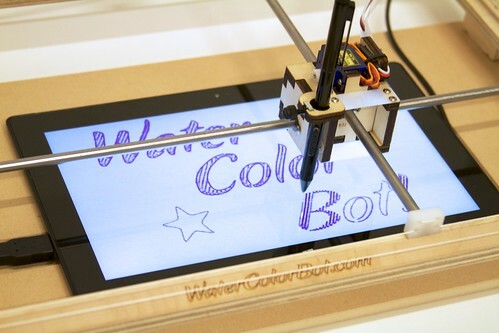 The WaterColorBot is designed to carry a paintbrush over a piece of paper, raising and lowering it as needed to paint a picture. 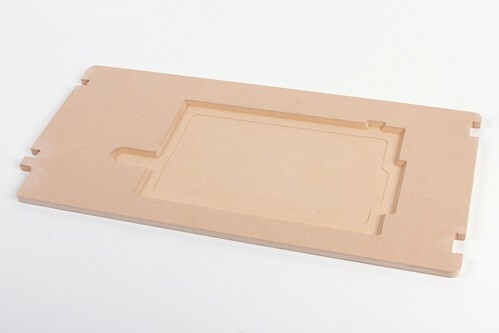 The movement and software control is similar to CNC router with special design modifications to make it lighter, cheaper and easier to control. A CNC router has to move heavyweight cutting bit with friction so needs expensive motors, rails, and belts. The WaterColorBot, on the other hand, needs only to move a paintbrush in a low friction environment. 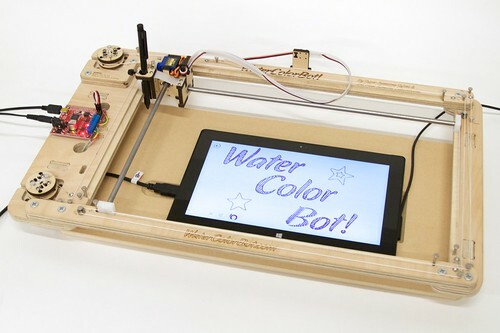 I was instantly sold on the idea of using a WaterColorBot to control the Surface. I backed the Kickstarter, waited for my bot to arrive, and started working on software. When the WaterColorBot arrived, I was not disappointed. The assembly was quick and I was robotically painting in no time. With the big mechanical and electronic solutions solved, my attention turned to the tablet. 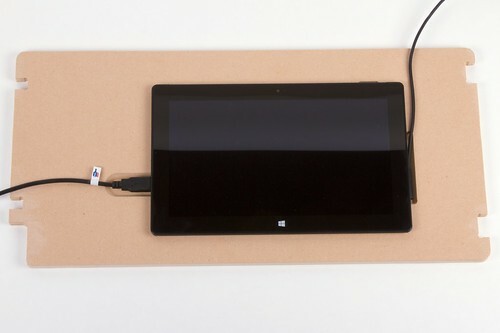 The Surface Pro is rare among tablets in that it uses a digitizer that allows extremely precise tracking with a stylus along with “hover” and “right-click” functionality. It does not need to be electrically grounded like a stylus for a screen that only supports capacitive touch. I was certain that the Surface Pro was the way to go, but not quite how it was going to be held together. The project was about to take a another serendipitous turn. At this point, I shared my enthusiasm with Windell and Lenore of Evil Mad Scientist and they gave me a unique offer: Stop by the Evil Mad Scientist shop and together we would make a custom cut spoilboard (lower deck) fitted to mount the Surface Pro 2. 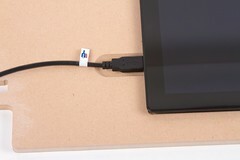 Wielding digital calipers and other measurement and software tools, Windell came up with a design that held the tablet firmly and had extra space cut out for the charger, power button, and USB cable. 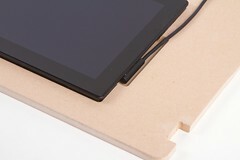 The area beneath the tablet has a lip and a lower recessed area. This design reduces wobble and makes it look even better. On the topic of machining – I got a few lessons in how larger CNC machines work. Windell showed me some design considerations in software and gave me a safety briefing about the CNC router itself. This thing can cut fast. After a little sanding, we fitted the tablet, spoilboard, and WaterColorBot together. Having the co-creators of the WaterColorBot with me on this journey was priceless, as we can see from the final assembly. The first spoilboard we cut matched perfectly and the tablet is held firmly in place. With enthusiasm fueled by seeing it all fit together, we decided to tell the WaterColorBot to do some painting. Windell loaded up an example sketch in Inkscape and, with only a minute to calibrate the stylus height, we were drawing! The software running on the Surface Pro is called FreshPaint and we chose a simple marker tool. In the video, you’ll hear a laughter break where the Surface picked up the floating toolbar in the app and dragged it around the screen. Given a little time, we could have taught the WaterColorBot to change brushes and colors in FreshPaint, but our goals for the day were met. The light weight and low friction of the Surface stylus is perfectly matched for use on the WaterColorBot. A custom fitted spoilboard means the Surface will always be at the exact same place on the X/Y plane, greatly simplifying future software development. Next project: Teaching the robot how to see! This entry was posted in CNC, EMSL Projects, Engineering, Open Hardware, Software, WaterColorBot and tagged cnc, surface, watercolorbot. Bookmark the Permalink. As a clock, once a minute it draws the minute hand, then the hour hand, and finally the outline of the clock face. As the water evaporates over the course of a few minutes, the old minute hands fade away. It’s a neat effect. 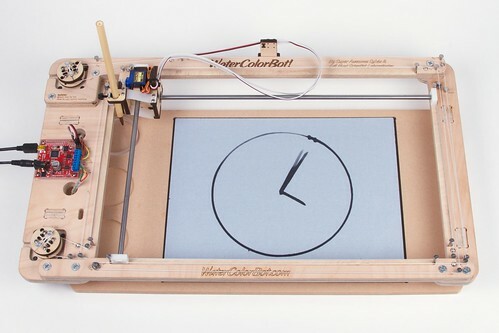 This entry was posted in Art, CNC, EMSL Projects, Engineering, Evil Mad Scientist Shop, Robotics, Software, WaterColorBot and tagged clocks, watercolorbot. Bookmark the Permalink. RoboPaint is an open source app for controlling painting/drawing robots, made for my daughter’s award winning Open Source WaterColorBot! The project is taking off with lots of users and lots of great features, and is all written in web standards node-webkit to run on all operating systems. This entry was posted in EMSL Projects, WaterColorBot and tagged Open Source Software, watercolorbot. Bookmark the Permalink. WaterColorBot experiments: moss+yogurt and algae+iron paint. With William Jennings. We’ll be looking forward to seeing followups on these experiments! This entry was posted in Art, Science, WaterColorBot and tagged art, watercolorbot. Bookmark the Permalink. 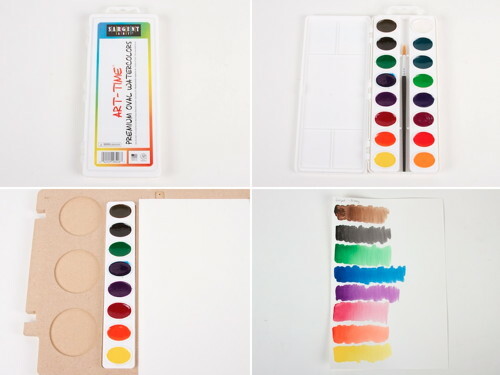 As part of the documentation for the WaterColorBot project, we’ve put together a compendium of information about commonly available watercolor paint palette sets. For each of the sets, we’ve tested to see how well they work in the WaterColorBot— in terms of physical size, color order, paint quality, brush quality, and so forth. 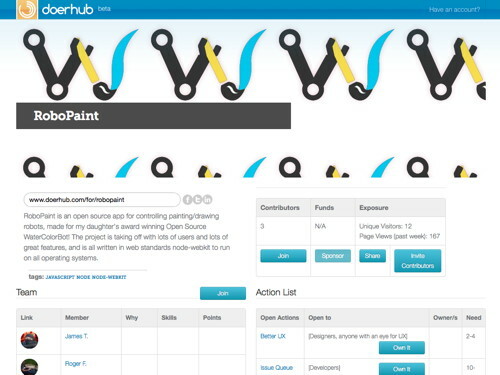 You can find the complete list on our documentation wiki site, here. This entry was posted in Art, EMSL Projects, WaterColorBot and tagged art, paint, painting, watercolorbot. Bookmark the Permalink. 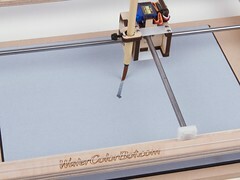 We’re very pleased to announce some updates on the WaterColorBot project— the watercolor-painting pen plotter that we designed in collaboration with Super-Awesome Sylvia. First and foremost: kits are (finally!) available from stock at our store, now that we’ve finished shipping the rewards from our Kickstarter campaign and our other pre-orders. We’ve also been working on a host of new applications and accessories that we’ll be writing about in the near future. The first new accessory is the Buddha Board holder pictured above, which indexes a Buddha Board (overly-interactive website link / Amazon.com link), that lets you make temporary paintings with just water. 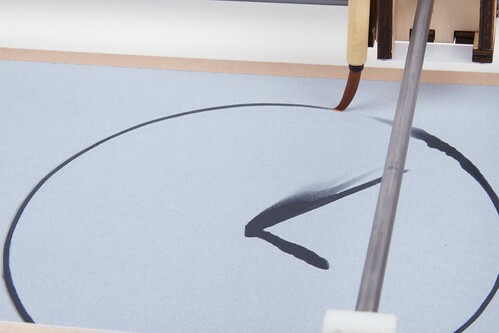 We’ve found the Buddha board not only to be one of the best tools for trying out new things on the ‘bot (without using up paint and paper) but also to be great for live demos of the WaterColorBot, so that you don’t need to provide a fresh sheet of paper for everyone that tries it out. 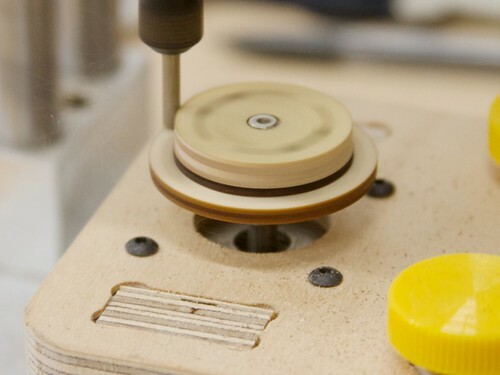 You can find it in our new index of WaterColorBot accessories. This entry was posted in EMSL Projects, Evil Mad Scientist Shop, WaterColorBot and tagged watercolorbot. Bookmark the Permalink. 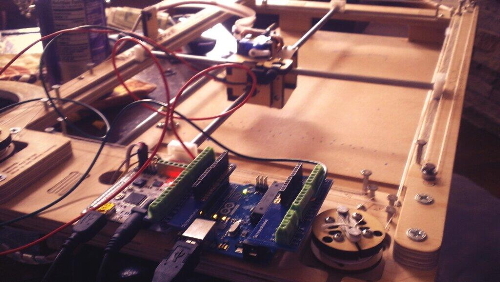 Via @programmer1200 on twitter, “…adding a microswitch and an @arduino in preparation for a laser addition.” We’ll be keeping our eyes on this WaterColorBot! 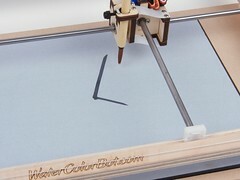 This entry was posted in Engineering, Open Hardware, WaterColorBot and tagged watercolorbot. Bookmark the Permalink. Ryan Lane posted a couple of short videos of the WaterColorBot drawing a Storm Trooper and Seattle with markers. He traced a photo of the Storm Trooper and applied a half-tone filter before plotting with the WaterColorBot. 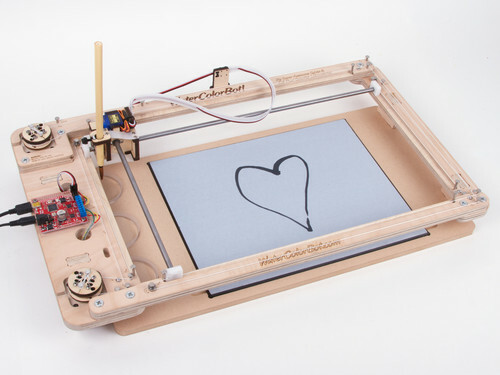 This entry was posted in Art, Electronics, WaterColorBot and tagged art, watercolorbot. Bookmark the Permalink. 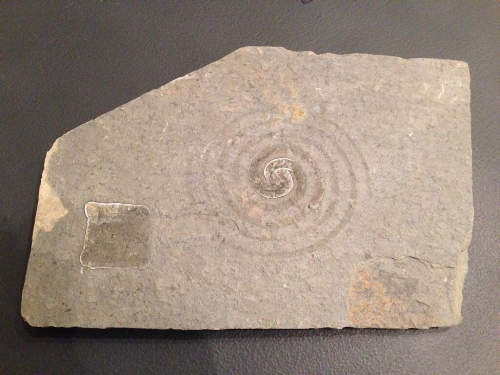 This entry was posted in EMSL Projects, Engineering, Open Hardware, WaterColorBot and tagged watercolorbot. Bookmark the Permalink.